Former Montreal Canadiens defenseman Larry Robinson and his family, look on during pre-game ceremonies to retire his No. 19. MONTREAL - Montreal Canadiens fans had waited a long time to give Larry Robinson the ovation he received Monday night, and they weren't going to sit down until they were good and ready. Robinson joined 12 other Canadiens legends when his No. 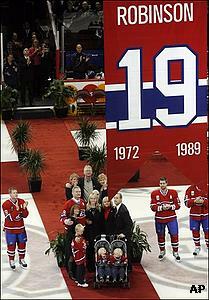 19 was retired and raised to the Bell Centre rafters before Montreal's game against the Ottawa Senators. Robinson received an ovation of several minutes when he was first introduced to the crowd, and he tried sitting down to get the fans to stop. But they refused, continuing for several more minutes despite Robinson's repeated attempts to get them to sit down. It was typical of the relationship Canadiens fans had with the "Big Bird," one Robinson acknowledged to close out his acceptance speech. "The final people I want to thank are you, the greatest fans in the greatest city hockey has ever known," Robinson said in French. "Without you, I wouldn't be here today. You warmly welcomed an Anglophone farm boy from Marvelville and made him fall in love with this city." Robinson was surrounded by his wife, Jeannette, his two kids, three grandchildren, two sisters and his brother, Moe. Though he vowed to the crowd he wouldn't "be a Mark Messier," Robinson choked up a little when thanking his wife and children for their support during his career. New Jersey Devils GM Lou Lamoriello, for whom Robinson currently works as assistant coach, gave the opening speech and told a story to reflect the human side of one of the most feared defencemen ever to play the game. Shortly after Robinson won the Stanley Cup as head coach of the Devils in 2000, Lamoriello remembered how the first thing he did after giving all the required interviews was to get in a cab and go to the hospital to visit with Petr Sykora, who had been injured in the game. "I find him to be one of the most caring and considerate individuals I have ever been associated with," Lamoriello said. Robinson becomes the 13th player to have his number retired by the Canadiens, joining Jacques Plante (No. 1), Doug Harvey (No. 2), Jean Beliveau (No. 4), Bernard (Boom Boom) Geoffrion (No. 5), Howie Morenz (No. 7), Maurice (Rocket) Richard (No. 9), Guy Lafleur (No. 10), Dickie Moore and Yvan Cournoyer (No. 12), Henri Richard (No. 16), Serge Savard (No. 18) and Ken Dryden (No. 29). "I am humbled to know my name will forever be in their company," Robinson said. Canadiens captain Saku Koivu and alternates Alex Kovalev and Chris Higgins presented Robinson with his No. 19 banner. After it was raised to the rafters Robinson walked on the ice and shook the hands of every single member of both the Canadiens and Senators who were lined up along the blue-lines, and then shook hands with both coaching staffs. Robinson's numbers with the Canadiens were extraordinary, setting franchise records for defencemen in games played (1,202), goals (197), assists (686), points (883) and points in a season (85 in 1976-77). He won six Stanley Cups with the Canadiens and also has the NHL record for playing 20 consecutive seasons in the playoffs, 17 of them with the Canadiens. But his most remarkable statistic is his career plus-730 rating, including a staggering plus-120 in 1976-77. Robinson was inducted into the Hockey Hall of Fame in 1995.